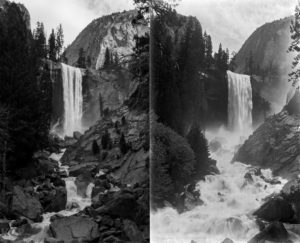 Okay, I know what you’re thinking – why should I care about Ansel Adams and his photography? He’s so cliché, everyone thinks they know about photography if they know about Ansel. I know you’re thinking that because I think that, too. However, our downfall is that we haven’t really seen his art. We didn’t know that artists kick started national park tourism and helped to preserve the natural wonders of the United States. It’s hard to think that any one man could do this, let alone a man who made photographs. It is not until you truly see his work that one can appreciate his mastery of contrast and how powerful his images can be. I recently went to Yosemite National Park for the first time with the intention to see if I could imitate Adams’s unique style, and, in doing so, improve my technique. While in Yosemite, I learned so many things about what made Ansel so prolific. The first thing you notice when driving into Yosemite Valley is how frickin’ huge everything is! We’ve all seen the pictures, but let’s face it – El Capitan cannot be contained in a teeny-tiny photograph. How can anyone convey the sheer size and magnitude of the 3,000 foot walls? The truth is, you can’t but you can exaggerate your photograph just like Ansel. Juxtaposition – Ansel played with scale constantly. The size of the pine trees at the edges of the frame appeared as large Mt. Watkins. Obviously, he was framing his image, but we never quite know how enormous the peaks were because our brains compensate for the obvious error – rocks are bigger than trees, right? I found it incredibly difficult to show how large these rock formations are. I found myself defaulting to placing 5’6” persons in front of a 3,000’ monolith to show the grandiose scale. While producing a chuckle, it did not quite convey the awe of actually being in that incredible place. Ansel knew that the scale could be tinkered with and that bigger doesn’t automatically mean better when it comes to composition. First and foremost, it should be mentioned that Ansel shot in black and white. The techniques he used are represented well in black in white and it may be more difficult to do in color (although they certainly can be applied). Color would add another dimension, but Ansel’s photographs are stunning just the way they are. In my opinion, I feel that color photography of the park is warm and inviting while Ansel’s photographs showed wilderness and maybe wasn’t as warm and fuzzy, but it did show respect for the power of nature – they are simply awe inspiring photographs. 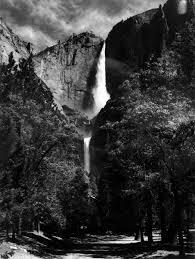 Contrast – Okay, so many people will call Ansel Adams a master of light. I prefer to say he was a master of contrast. The trick is not to be afraid of it. Currently, there is a large push for HDR (High Dynamic Range) photography. Many photographers and casual picture takers think it is amazing to get the best out of the shadows and highlights at the same time. It can be done well, but Ansel was not into this idea. In his zone system, zones 0, 1, and 10 had no detail in it what so ever (Just black, really dark grey, and white blowouts). His idea of balancing the photograph was to have many different grey zones accented by black and white. One last thing: it’s truly easy to make beautiful photographs when you have the most beautiful subjects. Don’t forget to actually experience these places! As a photographer, it’s hard to lower the viewfinder and just look up with naked eyes, but the beauty in the photographs is that it’s a snapshot of your memory – all you have to do is make the memory. For more Ansel Photographs, Click Here. Hi, I'm Katie! I like photography and travel. Any time I can get somewhere is a blessing and I'd love to see more and more of the world. I am mostly inspired by nature - in all of its glory. People can be cool too. I'm a former film production major with a specialization in editing but I have recently switched to history and now, film and photography are my hobbies.